There are several steps you will want to take immediately to help you jump-start your new business, these are outlined below. Coastal uses an outside company called COA Network to provide a state-of-the-art Automated Marketing System for use in your business. This Automated System is one of the most important tools necessary for your business. It helps you advertise, train and inform prospects, follow-up with them while you are doing other things and train your clients once they join. The four Websites, Members Section and Toll-Free TeleCenter numbers provided through COA Network are the only ones approved for use by Coastal . These are the only systems guaranteed to be up to date and current. The Tools page of this website has an outline of the benefits and features of this system. Choose a method, or methods, of advertising your business. At this point you have a new business and nobody knows about it. You need to decide what method of gathering leads works best for you. Most successful directors use a variety of advertising methods to bring new prospects into their business. Be sure to speak with your Director to find out what is working for him/her. The Advertising/Leads page of this web site has an outline of the various Lead suppliers that have been approved by the Coastal Board of Directors. They have been tested and tried to be sure that they provide quality leads. Here are a few things you need to consider when working from your home. 1. You need to have three-way calling. Your local phone company provides this service. With three-way calling you will be able to get a New Prospect on the phone with your Director so they can help answer any questions your prospects have. 2. It is best to have a flat-rate long-distance phone service or a very low cost per minute rate plan since you must have phone contact with each prospect. MCI: Go to http://www.mci.com and look to the top right of the site to enter your phone number and see if service is available in your area. This plan provides all of your Local Services, plus UNLIMITED Long Distance all for one low rate. Trinsic: Go to www.trinsic.com and enter your phone number to see if service is available in your area. This plan also provides all of your Local Services, plus UNLIMITED Long Distance all for one low rate. VOIP (Voice over Internet Protocol) Service: For those with Broadband Connections (Cable Modem or DSL), Internet Telephone Service has come a long way. 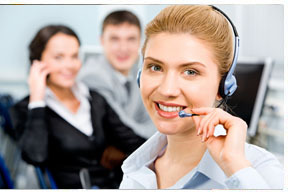 Here are a few links to such services: www.broadvoice.com, www.vonage.com, www.sunrocket.com and www.packet8.net. 3. Prepare a Work Space: Find a location in your home (preferably with a door) that can be a quiet spot for you to return phone calls, maintain records and manage your business. Although you may decide not to operate your business entirely from your home office, you will depend on this space as the place where it all comes together. HINT: Tax advantages usually allow for a deduction of a portion of your Rent/Mortgage Payment and Utilities for the use of this space in your new business. The greater the space, the larger the deduction. Keep in mind this space usually needs to be totally dedicated to the use of the business only. Please check with your tax advisor. 4. Prepare a Work Schedule: Determine when you will commit time to work your business. What days and what hours you will work, as well as what you plan to accomplish during that time. And then DO IT, let nothing distract you.. NOTE: Make sure all members of your family know when this time is so that interruptions will be limited. Traditional businesses usually do not see a solid profit their first year. Why do we bring this up? It makes the point that owning and running a business is not an overnight success. While Coastal has allowed many people to see immediate income in their very first week, it still requires constant effort. Most people are accustomed to going into work every day, 9 to 5, and then receiving a check on Friday for that actual work. When you own a business you may not get paid your first week. It may be several weeks or months before your first profit is realized. However, that profit is generally much larger than what would have been achieved by working for a few hours to collect a paycheck. Bottom line? Plan to work your Coastal business every day with the intent of working it long enough to follow it through to success. It has been said that “Success is a journey, not a destination”. Stay focused on the long-term success you are working towards.